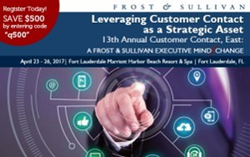 Qualfon will lead an interactive session addressing the human side of customer management during this year’s Customer Contact East 2017, a Frost & Sullivan Executive MindXchange event to be held on April 23-26 in Orlando, Florida. Customers will switch brands based on how customer service interactions make them feel. That’s why many professionals are looking for ways to make their service less about the transaction and more about connecting with the human behind the interaction. Qualfon, a mission-driven business process outsourcing (BPO) company and global provider of contact center services, will lead an interactive session addressing the human side of customer management during this year’s Customer Contact East 2017, a Frost & Sullivan Executive MindXchange event to be held on April 23-26 in Orlando, Florida. The breakout session, "The Human Side of Customer Management: Caring for the Customer as a Person," is a 60-minute exploration into how contact centers care for customers as real people, adding the human factor into every interaction. Kristi Walsh, Senior Vice President of Client Relations at Qualfon, will facilitate the discussion, sharing lessons learned and best practices for creating meaningful exchanges with each person. The session will be held Monday, April 24th at 10:20 AM Eastern. As a primary sponsor of the event, Qualfon will have an exhibit space and many executives in attendance to exchange ideas with attendees. Clients, contacts, and friends are invited to join Qualfon leaders for dinner on Monday night, immediately following the event activities. Fill out this form if you are interested in meeting with Qualfon at the event.